Between You & Me! Double Prediction! This mind reading effect is truly amazing! You write two predictions on two blank face cards and put them into a beautiful stand. Two spectators select any card they see. The two selected cards are then placed into the stand next to the predictions. You now spin the stand to reveal that both selections match your predictions! This trick is self-working and delivers a powerful punch, with no practice. 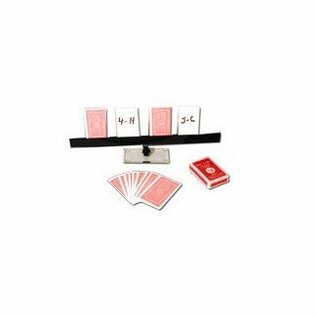 Comes complete with deck of cards, spinning display stand with base and enough blank faced cards to last a lifetime!